The Lambda 10-2 is a microprocessor controlled, high speed filter wheel. Its impressive speed coupled with exceptionally smooth operation make the Lambda 10-2 ideal for research applications involving fluorescence microscopy, ratio imaging, spectrophotometry, visual physiology, or any application requiring rapid and accurate aperture positioning. The Lambda 10-2 controller which has both serial and parallel interfaces will drive up to two filter wheels and two shutters. Each wheel can hold up to ten optical filters (25mm in diameter and up to 9mm thick) which are easily loaded through an access port on the housing. Additional filters (e.g. heat and/or neutral density filters) may be inserted manually at two other locations in the optical path. The optical ports on both sides of the unit are internally threaded as C-mounts (32 threads per inch). When mounted in an upright position, the center of the optical port can be positioned from 11cm to 53cm above the mounting surface. Slide-in filter holders are optionally available for inverted configurations. A second wheel can be added to the system with no need for additional mechanical or electronic changes. Eight user selectable speeds are provided. Filter to adjacent filter time can be set from 55 to 1200msec, depending on the number and the weight of the filters mounted in the wheel. Integral shutter drivers will open the optional shutter in 10msec. The use of a direct drive stepper-motor with advanced microstepping technology and intelligent acceleration and deceleration algorithms assures the fastest possible moves for a given inertial load, while minimizing vibrations. The controller also has an error detection and correction circuit in the event that a position error occurs. The controller system is designed around three embedded controllers; one slave for each wheel and a master for control and communication. The embedded controllers automatically detect the equipment installed and the source of the external commands, so there are no jumper wires or switches to set. The Lambda 10-2 consists of a 10-position filter wheel, a rack mountable controller, a support base and mounting rods, a controller/filter wheel interface cable, parallel and serial interface cables, two drop-in filter holders, spanner wrench, and manual. Microscope adapters for most Nikon, Olympus, Zeiss, and Leica scopes can be purchased separately. For applications requiring absolute vibration isolation, and/or spatial uniformity independent of wavelength, an optional liquid light guide output is available for the Lambda 10-2 wheel. The two meter long guide mounts directly onto the output port of the wheel. Transmission through the guide is better than 70% from 375nm to 575nm. Adapters to connect the light guide to your microscope port are available as an option. The Lambda 10-2/32, was designed to remedy the problem of vignetting that may occur with a 25mm filter format in certain microscope systems. The system features a modified Lambda 10-2 controller but includes a ten position wheel that accommodates 32mm diameter filters, up to 9mm thick. The best filter to adjacent filter switching speed in this system is achieved in 75 msec. A shutter for the system is optionally available. A T-mount format is used for mounting the wheel onto your microscope. Contact Sutter Instrument for information on available T-mount adapters. 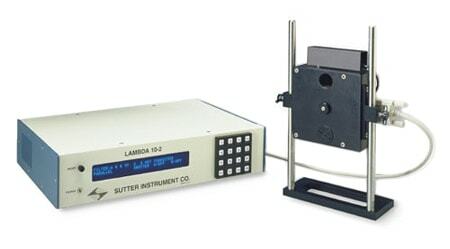 For OEM applications, the Lambda 10-2 can readily be modified to meet your specific requirements. By utilizing the 10-2 controller to drive customized wheels, we can provide an economical solution to your OEM design specification. To date we have made custom 2,3,4,5, 10 and 12 position wheels and have designed for 50mm, 32mm and 25mm filters. Our technical staff will be happy to discuss with you special application requirements. Simultaneous control of two wheels. Dual wheels mounted in series.